Last week, at WWDC 2013 in San Francisco, Crytek previewed its upcoming iOS tactical action game The Collectibles that is due out later this year. And 9to5Mac has the scoop. While Crytek is well-known for the popular PC and console games like Crysis and Far Cry, The Collectibles looks to be a tactical game with overhead controls. But probably more exciting is that the developer plans to use Apple’s new hardware standards and game controller APIs first discovered last week. 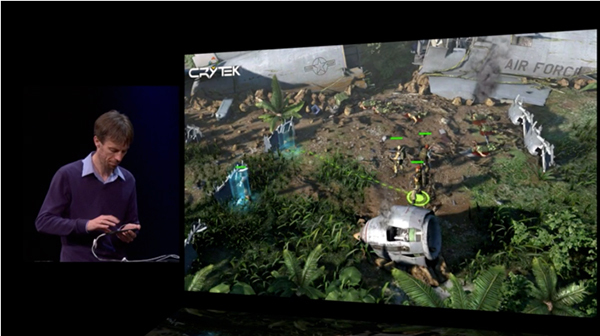 During the presentation, Crytek even offered a first-hand glimpse on how the gamepad integration will work. According to 9to5Mac, users will be able to easily switch between the hardware buttons and on-screen controls. With the new MFi controller, The Collectibles will allow players to use a touch-based navigation and cover system, but also seamlessly transition to the D-pad and physical controller buttons. For example, using touch controls, the user could draw a path to move a single character or double tap to move the entire squad. With the MFi controller, users can control the entire squad with the D-pad, and position characters behind the closest cover with single button presses. The controller will also allow the user to control the squad (using touch controls) and, for example, a gunship simultaneously with the hardware controls. And from the above screenshot, it even looks like the presenter was using Logitech’s recently leaked Made for iPhone controller. So it looks like the state of iOS gaming is about to get really interesting. I'm very excited about the chance to play games with a hardware controller.